We will pay rewards for information of up to $250 in the Student CrimeStoppers program and up to $1,000 in all other matters. 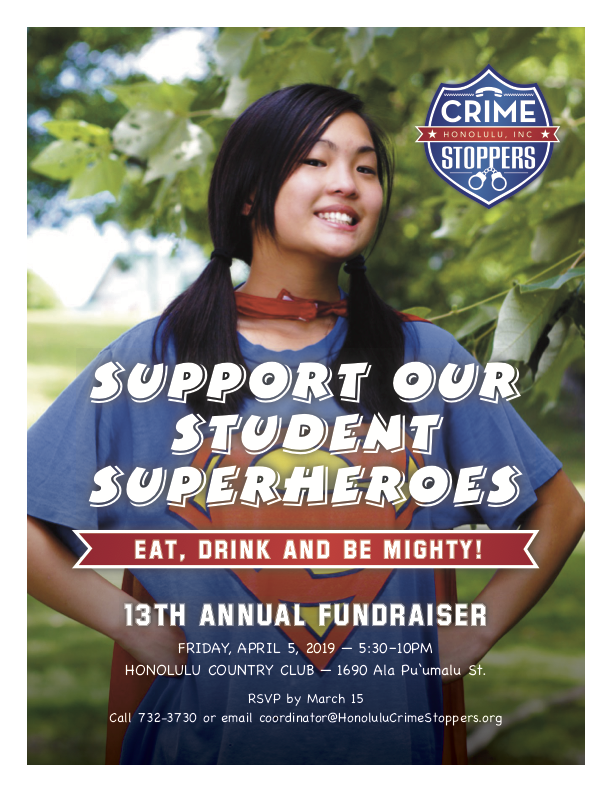 CrimeStoppers Honolulu has expanded the program to include affiliated Student CrimeStoppers and Animal CrimeStoppers programs. In these programs calls and information eligible for rewards includes activities occurring on educational campuses that is illegal or disruptive to the educational systems or in the case of Animal CrimeStoppers, any activity that also harms any animal. CrimeStoppers Honolulu relies on a professional, sworn police staff assigned by the Honolulu Police Department, volunteer phone operators and an all volunteer board of directors. Fund raising events and tax deductible contributions from the public allow us to operate and administer the program. NOTICE: The information contained in this Web site has been compiled from a number of sources and is subject to change without notice. We have attempted to provide current and accurate information, but incorrect information may appear on the pages. Should you come across any misleading, inaccurate or otherwise inappropriate information, please bring it to our attention via the contact page as soon as possible.